Inspired by the this, we were led by our lecturer Mika Rekola from the Department of Forest Sciences to valuate the price of good weather. The question was ”How much are you at maximum willing to pay for having nice weather like today during next week?” The answers ranged between 0 and 1000 euros based on personal preferences, wealth and other assets (e.g. umbrella), mode of transport, country of origin etc. Some doubted whether paying for weather was at all possible. Anyhow, even this simple mental exercise revealed the complexity of valuating an ecosystem service (or an environmental service in this particular scenario). 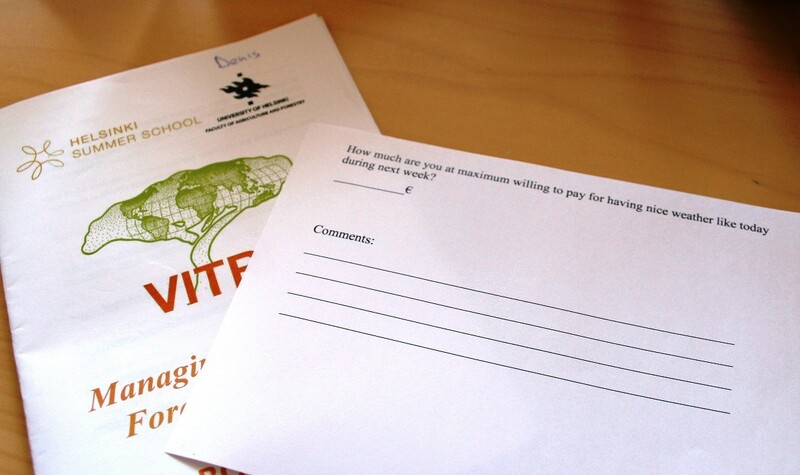 Contingent valuation, or willingness-to-pay, is the most common method to give a value to many intangible ecosystem services, such as biodiversity or scenic beauty. 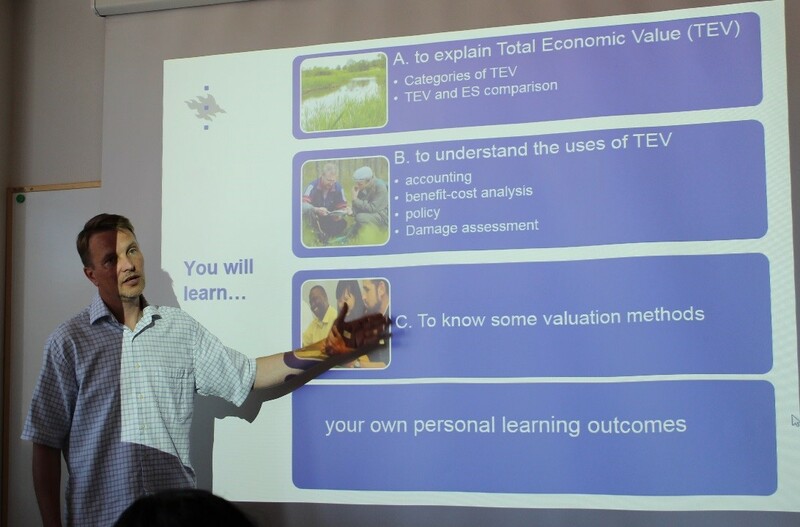 The lecture on Tuesday 11th August was focused on the valuation of ecosystem services. One of the most important points of the lecture was Total Economic Value (TEV), which means a sum of all market costs and benefits and externalities. During the lecture we received information about definition and classification of TEV, we understood how TEV concept can be used and we got to know valuation methods. 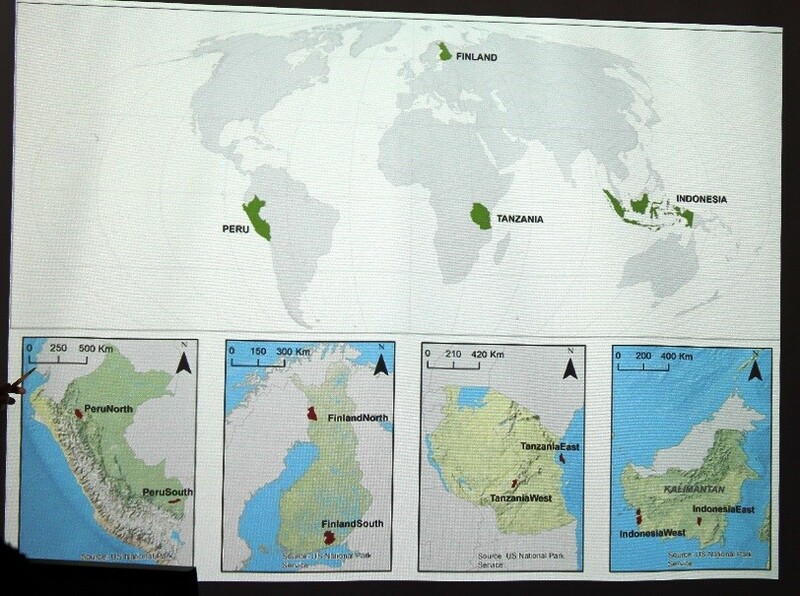 Forest-related examples of TEV and TEV’s classifications were quite interesting topics for discussion. We learned what the market failure behind deforestation is, and how and why it happens. Mika Rekola also taught us the differences between stock and flows of ecosystem services. For Denis who has environmental background it was extremely useful to understand better linkages between economy and nature protection, including valuation of ecosystem services. Denis will use the new knowledge in his work in WWF-Russia aimed at the protection of intact forests and developing sustainable forest management in the North-West part of Russia. Sara is somewhat cautious about the whole paradigm of valuating items that cannot really have a monetary value, and thinks that it is sad when the very ecological processes that we depend on for our lives have to be reduced to commodities that can be bought and sold in order for us to realize their worth. There seems to be a practical need for such a system at the global and national policy levels (since money speaks louder than words), but it is also an ethical question as it relates to how people perceive ecosystems and all living things. During the afternoon, we were introduced to 8 different landscapes by Markku Larjavaara from VITRI, including places in Finland, Indonesia, Peru and Tanzania. Later the landscapes were divided between the groups. Many groups had their minds eagerly set on the forested hills and sandy beaches of Tanzania, but after short and peaceful negotiations a consensus was reached and each group was matched with a landscape. The first task was to explore the ecotourism and recreational opportunities provided by the ecosystems, and it will be a fascinating journey to discover these landscapes from around the world with our groups. Bravo! The you tube commentaries from students of different nationals was such a well thought experience.